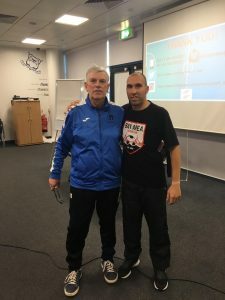 I was recently asked to share my knowledge of the early days of English futsal. For those not so young S America, with few exceptions dominated World football. The picture was different in those days, Brazilians played and lived in Brazil, they put country before club. Now it seems every top european club has a Brazilian playmaker wearing the coveted Pele number 10 shirt. Futsal dominated South America but misguided BBC sport would tell us these players learnt the trade on the beaches, a huge lie that continued year after year. When I set out meeting S.American coaches and students I had no idea the social impact futsal was having in S.America or that countries as diverse as Iran and Russia was huge at futsal. I imported a futsal ball (1998) and introduced futsal to St Martin’s School, the first UK school to train futsal. It took a further ten years before I could buy a ball in the UK. Previously I had met many South American coaches in an endeavour to discover why they were so successful at football compared, at that time, to the Home Nations countries. Without fail, everyone I meet extolled virtue of futsal in the S.American culture. Excited I started my first adult futsal league; a league that continues to this day. Initial applications to ‘affiliate’ the leagues to the FA were thwarted by the FA; as a consequence I picked up phone to FIFA to intervene. Bizarrely for two years all Fifa emails came to me as FA had no one showing any interest to develop game. One such email offered, at a price, opportunity to bring Iran, then ranked fifth in World to England. I circulated email to limited number of futsal friends and as a consequence Tranmere Victoria Futsal Club played Iran over two nights in Chester! The FA was invited to watch. That intervention led to FIFA setting up a meeting between the handful of ‘futsal’ people in England; FIFA and the FA. The meeting was held in the Hillsborough Leisure Centre Sheffield. A parallel tournament was held, Sheffield FC, Santos, Tranmere Victoria and four teams from Grimsby. As a result of that meeting a futsal development group was formed by the FA . I attended every meeting until such time the group was disbanded by FA when futsal become part of their FA’s official strategy. 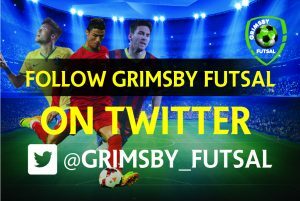 The achievements of Grimsby are mentioned in FA literature when outlining the progress of futsal. Grimsby leagues have seen two players play futsal for England; one for Great Britain Universities; plus three referees and I have officiated at FA National Finals. Grimsby referee Gavin Sartain (2010) was awarded the coveted FIFA badge. Grimsby’s Ben Mortlock has achieved 35 England caps and was England captain before injury interrupted his career. 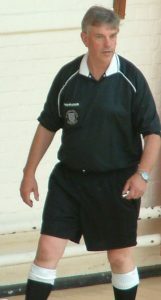 I have refereed 2500+ futsal games, including an FA Futsal Cup semi final (2003). 2004 along with a partner I started the Futsal Premier League North & South Divisions. These leagues played for 3 seasons until superseded by the FA creating their own National League. Northern Champions Doncaster Deaf College became the only disability team to qualify for a UEFA Final when they qualified for 2006 UEFA Futsal Cup Play Offs. When the FA (March 2008) started its own 3 conference futsal league (8 teams in each league); FC Grimsby was in the inaugural Northern section along with Sheffield FC who had also been in the Futsal Premier League previously. Over the years I have brought several international coaches to UK to improve our learning curve. In partnership with Daniel Berdejo-del-Fresno I have co-authored a book Coaching Children In & Through Futsal. The book aim is to highlight the trilogy between the player, the parent and the coach. A précis of twenty years promoting the world’s most played small sided game, a game the UK initially closed its doors to. This entry was posted in Kevin Bryant news updates on January 30, 2019 by Kevin Bryant.